Long Beach, CA, October 09, 2017 –(PR.com)– Long Beach, California-based skincare pioneers Envy Medical are proud to introduce their newest range of skincare, formulated to address age-related concerns including hyperpigmentation, dullness, sagging skin, and fine lines. With extensive renovations to their original formulations, as well as a complete packaging overhaul, Envy Medical’s Chief Marketing Officer, Sona Tolani, ensured that the brand’s new look and formulas are reflective of what the consumer wants both in terms of visible results and also to display on their vanity shelves. 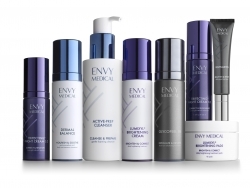 The Envy Medical range is now segmented into four offerings geared toward aging skin: Daily Skin Health Maintenance, Skin Brightening, Intensive Skin Brightening, and Skin Brightening & Renewal, with products from each intended to work together for optimal results, based on individual skincare goals. Utilizing patented ingredient technologies and Envy Medical’s exclusive Lumixyl® Peptide, researched and developed by Stanford University, regular use of the products results in a brighter, more even complexion that resists the overproduction of melanin. Soap-free cleanser recommended for all skin types, that soothes, preps, and cleanses, prepping skin for topical treatments. Calming, multi-functional, hydrating treatment that soothes, shields, and protects skin while improving texture. Daily brightening treatment that diminishes existing and prevents future dark spots, while boosting skin hydration and reducing appearance of fine lines. Individual pads that exfoliate skin and removes oil and surface debris. This leave-on treatment reduces the appearance of hyperpigmentation and improves skin texture. Antioxidant-rich nighttime treatment that brightens, softens fine lines, and evens skin tone and texture through enhanced cellular turnover. Available in 0.2% and 1.0% concentrations. Leave-on moisturizing treatment that also exfoliates skin using a 10% concentration of Glycolic Acid. Recommended for those with advanced signs of aging and dryer skin types. A potent, all-in-one brightening eye treatment that hydrates, improves tone and texture, and diminishes dark circles around the delicate eye area. Rich in antioxidants, it also helps prevent future damage. While products are formulated to be integrated to a complete skincare routine, they’re also ideal complements to Envy Medical’s signature professional treatment, Dermalinfusion. This 3-in-1 professional exfoliation treatment eliminates dulling surface matter like dead skin cells, removes it from the epidermis, and infuses skin with a specific serum that addresses dehydration, dullness, uneven skin texture and tone, dark spots, and oily-prone skin. This patented treatment is recommended for all skin types and can be used on most areas of the body, with few contraindications, resulting in more radiant skin, a stimulation in cellular turnover, plumper skin (by 70%) and more. Available in select medical offices, medspas and spas nationwide. Envy Medical is an advanced skin care system that harnesses scientific knowledge to provide clinically proven, non-invasive skin rejuvenation therapies. Leveraging innovative and patented technologies, Envy Medical's results-oriented, targeted skincare products are consciously formulated to deliver the highest quality ingredients and superior results without compromising skin’s delicate balance.